What Lemon Meringue looks like when sliced by a "regular person"
The great thing about this Passover Pie is that you can serve it the rest of the year and call it Gluten Free. 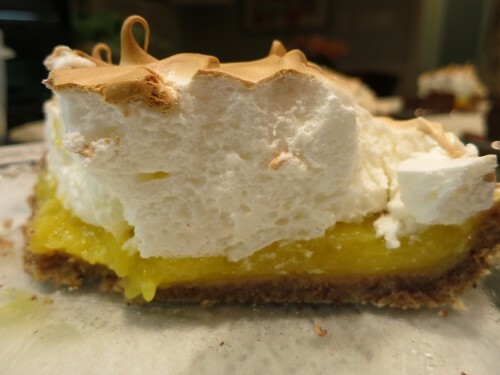 But I wouldn’t bother I would just call it really good Lemon Meringue Pie with Almond Crust. Attention sweet tooth people! This recipe makes a puckery tart lemony filling. If you prefer your pies on the sweeter side then add an additional ¼ cup sugar to the filling. Here’s another tip; have eggs at room temperature before you separate the eggs from the whites. It will be easier and the whites will be at the proper temperature for making the meringue. Also, you must have cream of tartar. Don’t make the mistake of saying to yourself “well I don’t feel like running out to the store now”. If you don’t have it, the meringue will never be quite right. The act of whipping the egg whites denatures or unfolds the proteins in the eggs, allowing the billowy cloud like texture you want. The cream of tartar ensures denaturing. Making Lemon Meringue Pie isn’t hard. The only trick is timing the filling and the meringue. You must put the meringue over very warm to hot filling. If you don’t you risk the dreaded weeping of the egg whites. And crying over Pie is just wrong. Mix almond meal and sugar together in bowl. Add pinch of salt if using coconut oil. Mix. Add melted fat of your choice and mix. (I just mix it all up with my fingers.) Crumble the mixture into your pie pan and press it in making a neat edge. Bake the almond crust in a preheated 350° oven for 15 minutes or until the crust is beginning to brown. Nuts burn quickly so watch it. Set the crust aside to cool completely before you add the hot filling. Meanwhile, put the room temperature egg whites in the bowl of your mixer and over low speed let the egg whites beat until they are foamy. Add the cream of tartar. Turn the mixer up to medium speed and continue to beat until they are at soft peaks. Place over medium heat and alternately whisk and stir with heat resistant spatula being sure to sweep the bottom of the pan with the spatula. First the mixture will thin out and it seems that it will never thicken, then as the mixture heats up it will begin to bubble around the edges and thicken quickly. Keep whisking/stirring so you don’t get scrambled eggs. When the mixture is obviously thickened and has come to a boil remove it from the heat and pour into your prepared pie crust. As soon as the filling is in the pie crust turn your attention to the meringue. If it has been sitting for a couple of minutes then beat it again. In order to avoid weeping you need to seal the filling completely with meringue. I start with the edge, using a thin pastry spatula or dinner knife to spread meringue so that it covers the seam where the crust meets the filling. Once that is done you can spoon the rest of the meringue on the pie and go to town making big pillowy swirls and peaks. The more swirls and peaks, the more browning you’ll have. Once you’re done playing with the meringue pop it in the oven for 15 minutes or until the meringue is set and browned to your liking. Let it cool then refrigerate until ready to serve.